Travel can mess up your normal rhythm of life, especially your sleep schedule! Crossing a few time zones can disturb your inner sense of time, meaning your body is in Europe at midnight while your mind is still in the United States in the early afternoon! You may feel groggy, imbalanced, even nauseated. Here are some tips to get back on a normal sleep schedule after traveling! There’s no sure-fire way to avoid jet lag, but one of the best ways to reduce its effects is to get on the local time schedule before you leave. A few days before your flight, start to go to bed closer to the destination’s time zone. If it’s five hours later where you’re headed, go to bed an hour or two later, and wake up the next day an hour or two earlier. Doing this for just two or three days can give your body a much-needed boost on arrival. Your body loves its habits—so start a healthy habit early by getting into a regular routine. Wake up at the same time, eat lunch at the same time, go to bed at the same time. Give your body biological cues to feel hunger or sleepiness. Be kind to your body—relax an hour or two before sleep. Turn off electronics such as T.V.s, cell phones, e-readers, tablets, and laptops. Listen to soothing music. Stretch out the kinks with some yoga. Take a long bath (this is my favorite thing after a long plane ride!). Speaking of stretching, try working out! Exercise is fantastic for sleep. Not only does it burn fat and build strength, it tires your body so you can enjoy a deep and restful sleep. Just be sure to exercise in the morning or early afternoon—the closer to bedtime, the more disruptive exercise can be. It’s a little-known fact that these little cherries may improve the quality of your sleep. The cherries are a natural source of melatonin, which promotes the efficiency and duration of sleep and reduces chances of insomnia—nobody wants that after arriving home from a long trip. 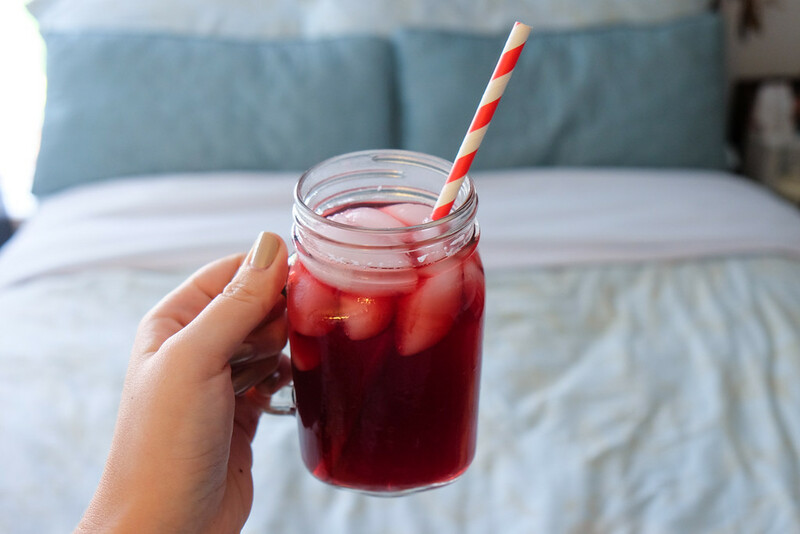 Try a glass of Montmorency tart cherry juice every morning and night before sleep for a few weeks, and you’ll see improvement. Light and darkness are cues to your body when it’s time for alertness and when it’s time for sleep. Take actions to reset your body’s clock. In the morning, encourage your brain to wake up with open windows, bright lights, or a walk in the sunshine. As for nighttime? I already mentioned turning off your laptop right before sleep; dimming the lights in the room will also help. Your stomach also responds to routine. Eat dinners between 6:00 p.m. and 8:00 p.m. A large late-night meal can disrupt your daily rhythm. Your body also stores more fat with a midnight meal. Avoid these risks altogether and keep your suppers to an earlier hour. Naps can be a blessing on a long travel itinerary. You may find yourself nodding off at various intervals—on the airplane, in your taxi, during the first moments after you’ve checked into your new hotel. My tip: keep these naptimes brief. An optimal time is about 20 minutes—your body gets a break but doesn’t get bogged down with sluggishness. Keep it short and sweet, and there will be no chance that your body is fooled into thinking that naptime equals new sleeptime. This article was written in partnership with the Cherry Marketing Institute. For more information on the research and science supporting the health benefits of tart cherries and delicious cherry recipes, visit the Choose Cherries website. As always, opinions expressed here are entirely my own. Great tips! I wanted to mention breathing! Sounds simple, and maybe even dumb, but it works! If you find yourself trying to get back into that routine of sleeping and just can’t, taking deep breathes will MAKE your body relax. It has not other choice due to the increase of oxygen slowing down your heart rate, which makes you relax! It worked for me. Take 4 seconds to inhale and 4 seconds to exhale and focus on it! You will get relaxed and be back to sleeping on your schedule with a couple, few nights of this!